News item: Trump Vineyard Estates has applied for six seasonal foreign-worker visas, hoping to underpay Mexicans for the skilled job of pruning grapevines. Hot take: Trump sends jobs to Mexico! Realistic take: Tending grapevines is skilled labor, and there aren't enough Americans who do it. In 2014, one Mendocino County winery began using prison labor to harvest grapes because of the shortage of farmworkers. And grape picking requires less skill and experience than pruning. Hopefully Trump's personal experience with his namesake winery will encourage him to support more temporary farmworker visas. We can't feed America without the help of our neighbors in Mexico. 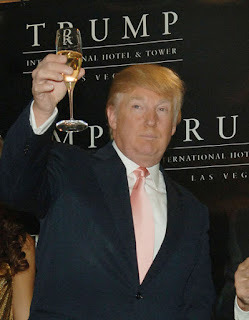 Hot take: Trump winery pays only $10.72 an hour for grape pruners. If the job paid better, more Americans would do it! Realistic take: That will be true if the US goes into another great depression, but until then, not likely. Despite everything you've read recently about the desperate economic situation of angry white men in small towns, that rural America and wine-country America are still far apart, geographically and philosophically. Trump winery is in Charlottesville, a wealthy part of Virginia, where real estate values are probably helped by the presence of the wine industry. Trump voters struggling economically in West Virginia or South Carolina might take a pruning job, but they can't afford to relocate where the grapes are because they won't put up with the migrant farmworkers' standard of living: life in barracks or trailers or sleeping in cars, with their families left behind. We're not at "Grapes of Wrath" level desperation yet. And philosophically, there just aren't many non-Mexican-Americans who want to do farm labor for somebody else in this country. There are always farm labor jobs to be had in California and most pay better than $10.72 an hour, but there is still a shortage of workers. Hot take: We hate Trump and want to mock him for his hypocrisy on this issue. This Mexican farmworker thing will bring him down in the eyes of his supporters! Realistic take: Good luck with that. That's about as close to Trump's lips as a wine glass will get, as he's a teetotaler. I am reminded of Tom Lehrer's song about "braceros" and California senator George Murphy.